Welcome to the website of “Pasión Flamenca de Los Angeles” and be inspired! 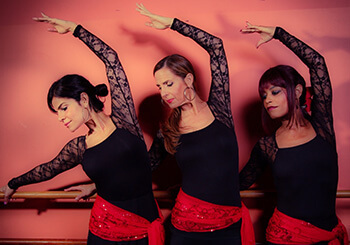 Pasión Flamenca de Los Angeles is a Contemporary Flamenco Fusion dance group comprised of Raquel Leal, Elizabeth Ipiña, and Kelly Kelliente Richardson. 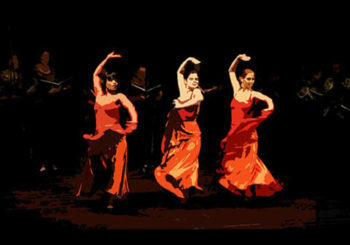 Based in Los Angeles, with a combined background in Flamenco, Modern, Ballet, Jazz, Salsa, Bachata, and Afro-Cuban dance, Pasión Flamenca de Los Angeles creates unique choreographies inspired by, but not limited to, traditional flamenco. 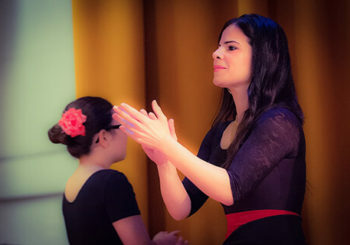 Raquel, Elizabeth, and Kelly met while training and performing flamenco with Maestra Celina Zambón. In 2011, they decided to combine their diverse talents, friendship, and love of the Spanish art form to make this original group. Since that time, Pasión Flamenca de Los Angeles has created original choreographies that blend the dancers individual flavors and combined chemistry. Pasión Flamenca de Los Angeles collaborates with other artists in order to create contemporary pieces that beckon the soulful tradition of flamenco. Currently, they are choreographing and performing with the Kol Sephardic Choir, a multicultural group of singers who specialize in the singing of Sephardic Romanceros sung in Ladino. Most recently, they can be viewed in a music video with ANJEZA performing “Warrior”, a song about the power of women. If you are interested in booking or collaborating with the group, please contact them at: info@pasionflamencala.com.